With this delicious Tuscan Pasta Salad, you will be the bell of the ball. This is a simple pasta salad with customizable ingredients. Make this recipe gluten free. Just substitute the gluten pasta for gluten free pasta and off you go! 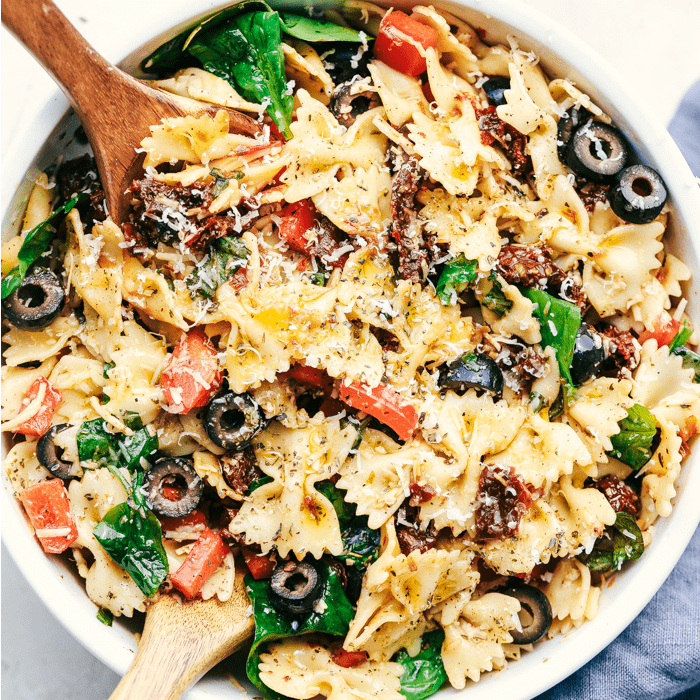 In a large bowl combine pasta, sundried tomatoes, bell pepper, olives, spinach, basil, and parmesan cheese. Toss until combined. To make the dressing: In a small bowl whisk olive oil, vinegar, water, salt, sugar, oregano, basil, garlic and salt and pepper. Drizzle the dressing over the pasta salad and serve. Watch Alyssa make this dish on her website The Recipe Critic. Previous Post: « What Curriculum Should I Buy If I Have My Child Has A Learning Disability?